Chennai: Leading Tamil Satellite Channel Raj TV Network is in the process of bolstering its prime time offerings with slew of new launches. After the roll-out of new comedy fiction show Sabitha @ Sabapathi on 4th January in its 6:30 PM time band, the Channel is set to launch another fiction show titled Indira on 15th February in its 9:30 PM time band. The story revolves around a girl named Indira (Jigyasa Singh, who stammers. However, she doesn’t let her incapability destroy her cheerful and obedient character. Indira’s parents were keen on getting her marriage done, but owing to her speech impediment, no one was willing to marry her. Her parents managed to get her alliance fixed with “Diwakar” who is shorter than Indira. He then demands dowry after finding that the girl stammers and rejects to marry her in the marriage. After being rejected, Indira accepts a job at a news channel owned by Dhruv Pandey and moves to Noida with her mother followed by her father and two siblings. Both Indira and Dhruv soon fall in love with each other. Dhruv’s mother, Vasundra, who doesn’t like stammering or anything that doesn’t work or run properly, fixes Dhruv’s alliance with Indira without knowing about her stammering problem. When she comes to know about it, she tries her best to separate the duo. On the day of their marriage, she emotionally blackmails Bihaan, who is her adopted son and forces him to marry Indira after drugging Dhruv on the day of their marriage. Dhruv and Indira are separated, and Indira is shocked to see Bihaan as her husband. She then starts despising Bihaan for separating her from her love and spoiling her life. Indira and Bihaan are forced to live together until they get divorced. Vasundra then plans to get Dhruv married to Shraddha, a girl of her choice. Indira, too, helps her as she wants Dhruv to move on in life. But later, Bihaan and Indira find out that Shraddha isn’t who she pretends to be and has hidden motives. Bihaan and Indira then team up to expose Shraddha but fail to stop the marriage, instead end up getting closer to each other and pave the way for a potential new love story. 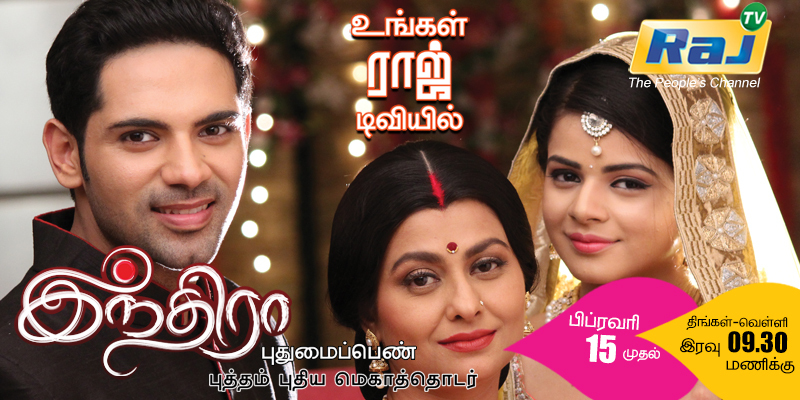 Shradhha then teams up with Vasundra to make Indira’s life hell. As they continue to humiliate Indira, bihaan stands by her like a pillar of support which makes their bond stronger and stronger as the story moves on. Indira on Raj TV is slotted in its 9:30 PM time band and its is scheduled to be aired on every Monday to Friday. The Channel has initiated a 15 days 360 degree Multi Media Campaign to promote the new show launch.